Products and designs involving acoustic phenomena can be modeled to study and predict factors like sound quality and noise reduction performance. 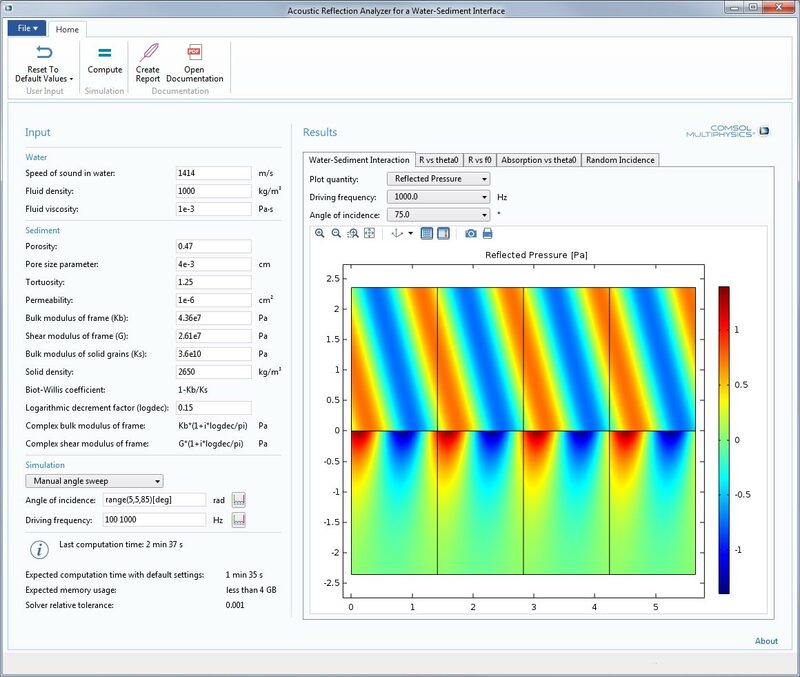 The Acoustics Module is an add-on to the COMSOL Multiphysics® software that provides tools for modeling acoustics and vibrations for applications such as speakers, mobile devices, microphones, mufflers, sensors, sonar, and flow meters. You can use the specialized features to visualize acoustic fields and build virtual prototypes of devices or components. For more detailed studies, acoustics can be coupled with other physical effects, including structural mechanics, piezoelectricity, and fluid flow. The COMSOL® software contains multiphysics couplings to enable you to evaluate the performance of a product or design in an environment that is as close as possible to the real world. 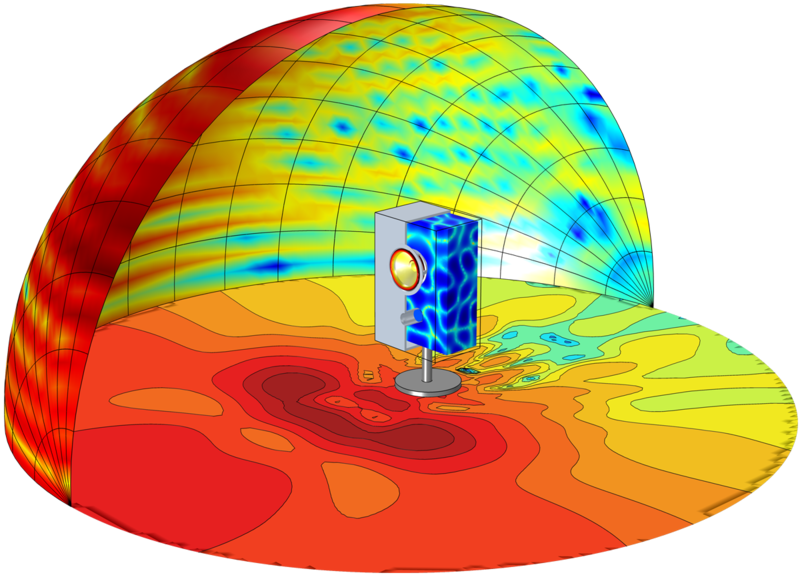 The Acoustics Module also includes many specialized formulations and material models that can be used for dedicated application areas, like thermoviscous acoustics used in miniature transducers and mobile devices or Biot's equations for modeling poroelastic waves. The multiphysics environment is extended further with several dedicated numerical methods, including the finite element method (FEM), boundary element method (BEM), ray tracing, and discontinuous Galerkin finite element method (dG-FEM). When you expand the COMSOL Multiphysics® platform with the Acoustics Module, you have access to features for specialized acoustics and vibration analysis in addition to the core functionality of the COMSOL® software. The modal behavior of a room is studied using an eigenfrequency analysis. The model includes complex impedance conditions to model absorbing surfaces. The sound pressure level distribution in a car cabin is generated by a small speaker located in the dashboard. The pressure acoustics model includes complex-valued surface impedance of the lining, carpet, plastic surface, and seats. Design and analysis of a tonpilz transducer array used in sonar applications. The model couples piezoelectric material structures and acoustics in water modeled with boundary elements. The spatial sensitivity is easily calculated and visualized. Modeling of vibration and noise in a 5-speed synchromesh gearbox. A transient multibody analysis computes gearbox vibrations for the specified engine speed and external load. Acoustics analysis finds the SPLs in the near, far, and exterior fields. To model pressure acoustics effects, such as the scattering, diffraction, emission, radiation, and transmission of sound, you can use the pressure acoustics interfaces. Problems are modeled in the frequency domain via the Helmholtz equation or in the time domain via the classical scalar wave equation. There are many options to account for boundaries in acoustics models. For instance, you can add a boundary condition for a wall or an impedance condition for a porous layer. You can use ports to excite or absorb acoustic waves at the inlet and outlet of waveguides using multimode expansion. Sources like prescribed acceleration, velocity, displacement, or pressure can be applied on exterior or interior boundaries. Further, you are able to use radiation or Floquet periodic boundary conditions to model open or periodic boundaries. You can also compute and visualize the exterior field in a model with open boundaries including everything from the near field to the far field. The radiation pattern or spatial response can be visualized with polar plots or a directivity plot. Performance analysis of a muffler system that contains a porous lining material. The frequency domain simulation results include the transmission loss of the system. Here, the energy flow (intensity) is visualized together with pressure isosurfaces. A vented loudspeaker placed on an infinite plane. 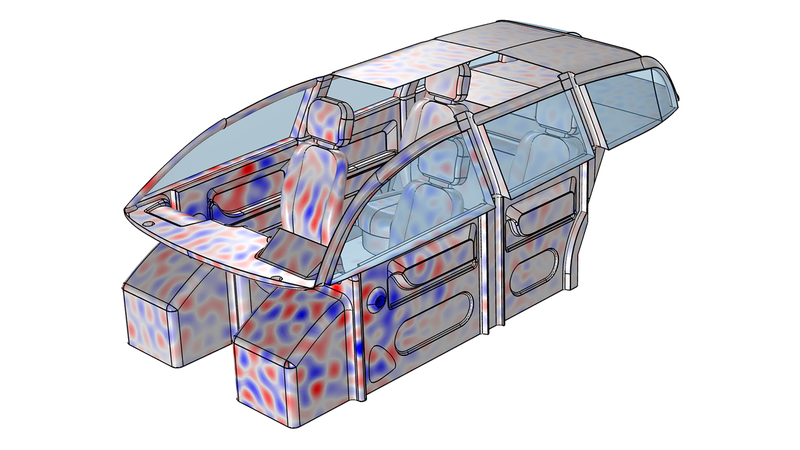 Radiation modeled with an FEM-BEM approach: FEM-based structural shells for the driver, FEM-based interior acoustics, and BEM for the exterior radiation. The SPL distribution is shown at 3000 Hz. Using the Acoustics Module, you can simulate the interaction between acoustics and structural mechanics within a product or design. Predefined interfaces enable you to study vibroacoustics and automatically couple fluid and structural domains. The Solid Mechanics interface uses a full structural dynamics formulation that accounts for the effects of shear waves and pressure waves in solids and analyzes elastic waves. A dedicated Poroelastic Waves interface is used to model the coupled propagation of elastic and pressure waves in porous materials solving Biot's equations. Multiphysics couplings can easily couple porous domains, solid domains, piezoelectric materials, and fluid domains to model the behavior of real-life devices. Structures can be prestressed and their harmonic behavior can be analyzed while fully coupled to acoustics. Frequency domain analysis of a vented loudspeaker driver unit to determine the on-axis sensitivity and spatial sensitivity. The model combines structural shells and acoustics and is set up using a predefined multiphysics coupling. Frequency response of a tonpilz transducer is studied to find structural/acoustic responses: deformation, stresses, radiated pressure, SPL, far-field beam pattern, transmitting voltage response curve, and directivity index of the sound beam. 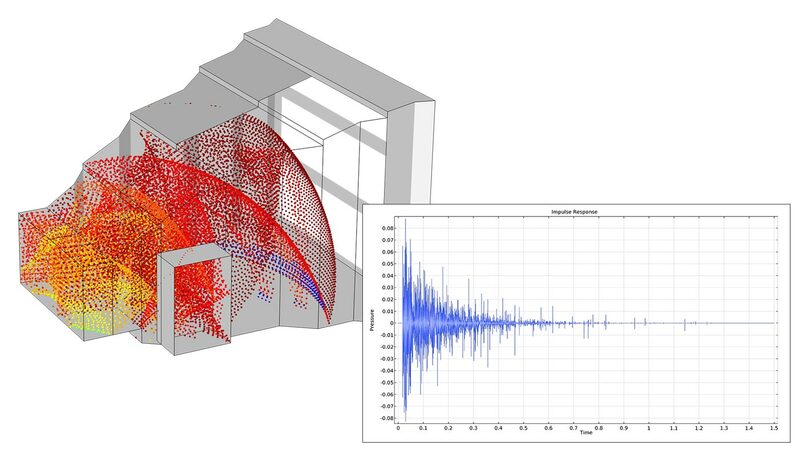 The geometrical acoustics capabilities of the COMSOL® software can be used to evaluate high-frequency systems where the acoustic wavelength is smaller than the characteristic geometric features. There are two interfaces for computing geometric acoustics available with the Acoustics Module: Ray Acoustics and Acoustic Diffusion Equation. With the Ray Acoustics interface, you can compute the trajectories, phase, and intensity of acoustic rays. Additionally, you can calculate impulse responses and energy decay curves with a specialized Receiver data set and other postprocessing tools. The rays can propagate in graded media, which is necessary in underwater acoustics applications. For simulating ray acoustics in both air and water, specialized atmosphere and ocean attenuation material models are available that are important for wave propagation over large distances and at high frequencies. With the Acoustic Diffusion Equation interface, you can determine the sound pressure level distribution in coupled rooms and the reverberation times at different locations. The acoustics are modeled in a simplified way using a diffusion equation for the acoustic energy density. This interface is well suited for quick analyses inside buildings and other large structures. Simulation of the acoustics of a small concert hall using the Ray Acoustics interface. Boundary conditions include frequency-dependent absorption and scattering properties. Impulse response reconstructed using the dedicated postprocessing functionality. 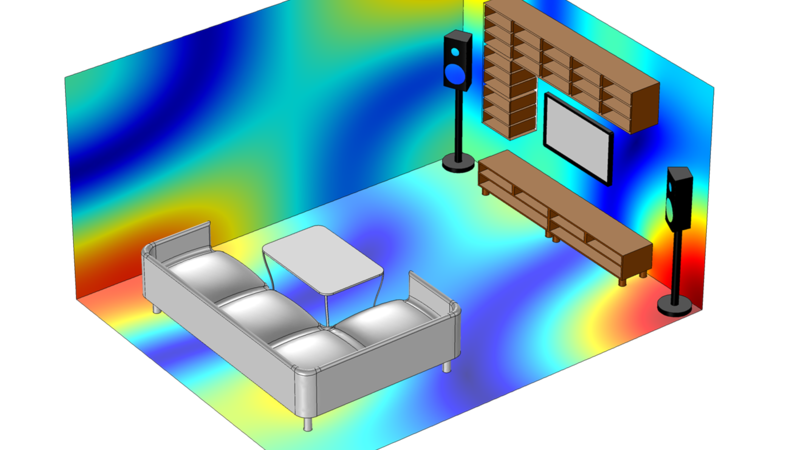 The Acoustic Diffusion Equation interface solves steady state SPL (acoustic energy density) distribution for a given sound source in a 2-story house. An eigenvalue solver finds room reverberation times. A time-dependent study finds energy decay curves. You can efficiently solve computational aeroacoustics (CAA) problems with a decoupled two-step approach in the Acoustics Module. 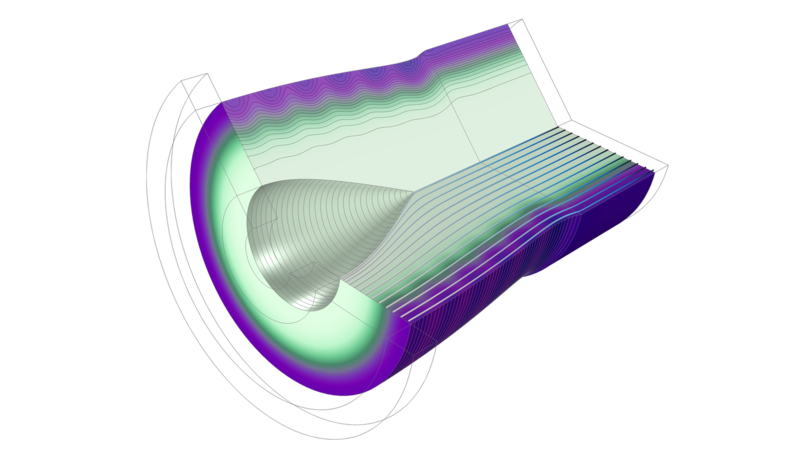 First, you find the background mean flow using tools from the CFD Module or a user-defined flow profile; then, you solve the acoustic propagation problem. This is also sometimes referred to as convected acoustics or flow-borne noise simulations. Predefined interfaces can compute acoustic variations in pressure, density, velocity, and temperature in the presence of any stationary isothermal or nonisothermal background mean flow. The formulations readily account for the fluid-borne sound, convection, damping, reflection, and diffraction of acoustic waves by the flow. There is also functionality for FSI analyses in the frequency domain with predefined couplings to elastic structures. Acoustics analysis of a Helmholtz resonator and the effect of mean flow in the system, modeled using the Linearized Navier-Stokes, Frequency Domain interface. The model captures the convective effects of the flow and attenuation due to turbulence. 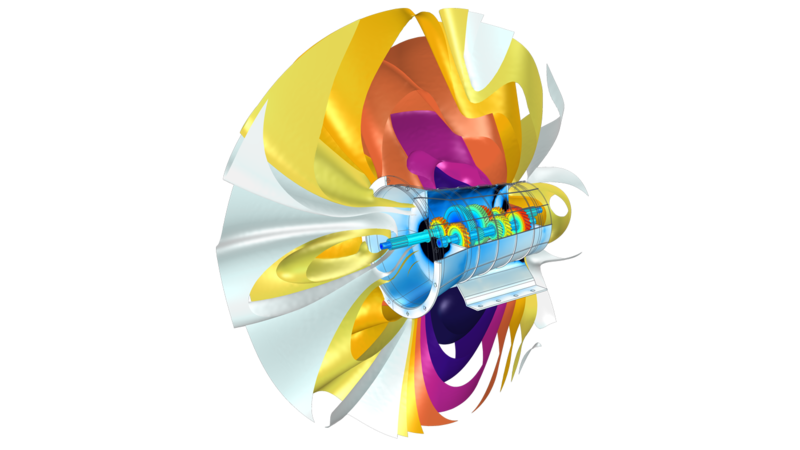 The acoustic field of an axially symmetric aeroengine duct, generated by a noise source at the boundary, is modeled. 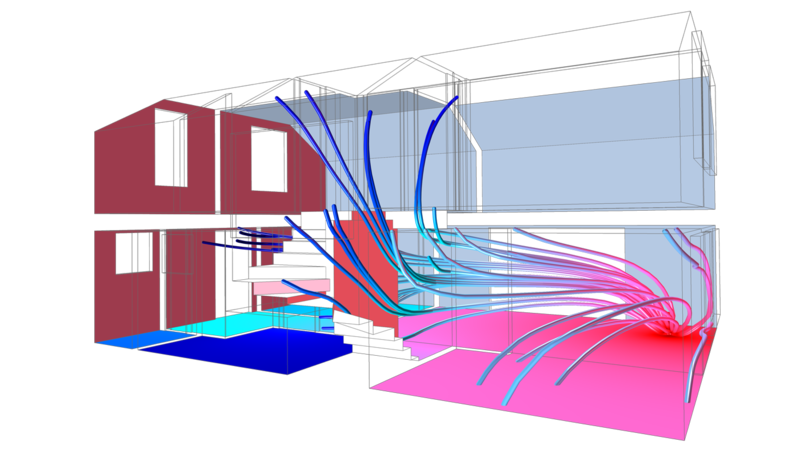 Simulation results are computed for ducts with and without compressible irrotational background flow and hard and lined duct walls. For an accurate analysis of acoustic propagation in geometries with small dimensions, you need to account for losses associated with viscosity and thermal conduction; particularly, the losses in the viscous and thermal boundary layers. These effects are solved in full and automatically included within the equations solved by the thermoviscous acoustics interfaces. These interfaces are well suited for vibroacoustics modeling in miniature electroacoustic transducers like microphones, mobile devices, hearing aids, and MEMS devices. For detailed transducer modeling, you can use the built-in multiphysics couplings between structures and thermoviscous acoustic domains. The interface accounts for additional effects, including the full transitional behavior from adiabatic to isothermal at very low frequencies. There is also a dedicated interface for computing and identifying propagating and nonpropagating modes in narrow waveguides and ducts. Response of a Knowles ED23146 balanced armature receiver (miniature loudspeaker) when placed in a standardized measurement setup. The model results align much better with the Knowles setup when incorporating acoustic losses. The Ultrasound interfaces are used to compute the transient propagation of acoustic waves over large distances, relative to the wavelengths. Acoustic disturbances with frequencies that are not audible for humans are classified as ultrasound. This implies that ultrasonic waves have a short wavelength. The Convected Wave Equation, Time Explicit interface is used to solve large transient linear acoustic problems containing many wavelengths in a stationary background flow. It is suited for time-dependent simulations with arbitrary time-dependent sources and fields. The interface is based on the dG method and uses a time-explicit solver, which is a very memory-lean method. Explore some of the key features and functionality of the Acoustics Module in the sections below. Whether you want to use spreadsheet data in your model or import a complex CAD geometry, there is an interfacing product for your needs. You can interface the COMSOL Multiphysics® software with a number of third-party tools, such as MATLAB® software, Microsoft® Excel® spreadsheet software, Inventor® software, and more via the LiveLink™ products. The solvers and methods used to complete analyses in the COMSOL® software are both flexible and efficient. Problems encountered in acoustics span many decades of frequencies. The computational complexity can be highly dependent on the acoustic formulation. As a consequence, no single method or numerical technique is suitable for all acoustic problems. The Acoustics Module includes four different computational methods: FEM, BEM, ray tracing, and dG-FEM, as described below. Different study types complement the different numerical formulations in order to allow for all necessary analysis types. This includes, but is not restricted to, frequency domain, eigenfrequency and eigenmodes, and transient studies. Dedicated iterative methods make it possible to model large multiphysics and multimethod problems involving many million degrees of freedom. It is simple to include acoustic losses in a model. This enables you to model, for example, porous and fibrous materials by solving Biot's theory via the Poroelastic Waves interface. Alternatively, porous domains can be modeled with an equivalent fluid approach using the Poroacoustics material model in pressure acoustics. Poroacoustics include, for example, the Delany-Bazley, Miki, and Johnson-Champoux-Allard models. Losses and attenuation can also be included as user-defined expressions, analytical models, or data based on measurements. 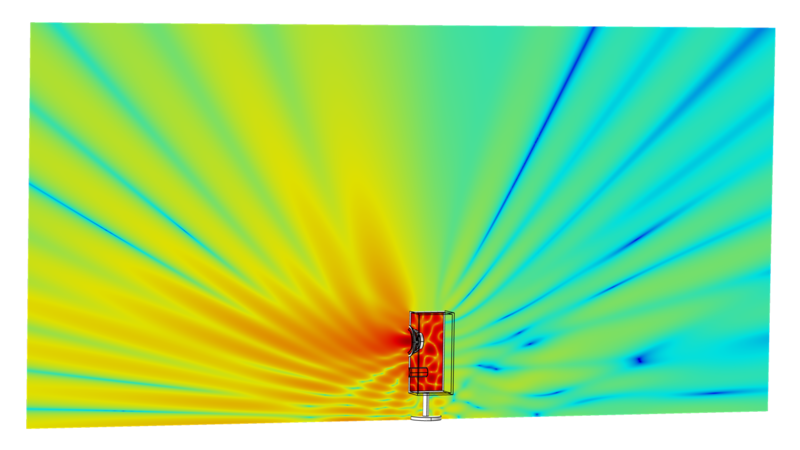 Detailed models including thermal and viscous losses can be set up with the Thermoviscous Acoustics interface. This includes all effects associated with the acoustic viscous and/or thermal boundary layers. To model their damping, you can couple to vibrating structures by simply using the built-in multiphysics couplings. In waveguides or structures of constant cross section, a simplified approach based on homogenization of the boundary layer losses can be achieved using the Narrow Region Acoustics material model in pressure acoustics problems. The attenuation of acoustic signals as they travel through a moving fluid including high flow gradients, temperature gradients, or turbulence can be modeled in detail with the Linearized Navier-Stokes interfaces. 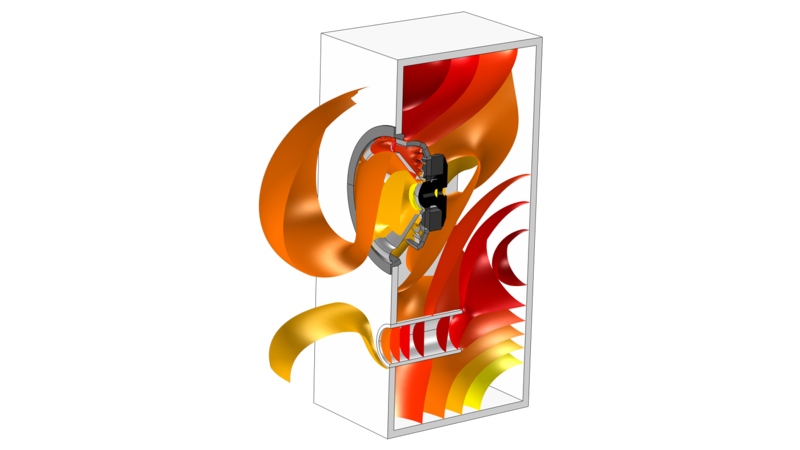 The background flow can be calculated using the capabilities of the CFD Module. When modeling transducers of all sorts, the capabilities included in the Acoustics Module are readily combined with functionality from the AC/DC Module or the MEMS Module to create fully coupled multiphysics FEM models. This includes detailed modeling of magnets and voice coils in loudspeaker drivers or the electrostatic forces in condenser microphones. In electro-mechanical-acoustic transducer systems, it is easy to use lumped circuit models to simplify the electric and mechanical components. Both approaches are solved with a fully two-way coupling. In miniature transducer systems, like mobile devices, condenser microphones, and hearing aid receivers, the important damping due to the thermoviscous boundary layer losses is included in detail using the Thermoviscous Acoustics interfaces and the multiphysics couplings to other physics like vibrating structures. 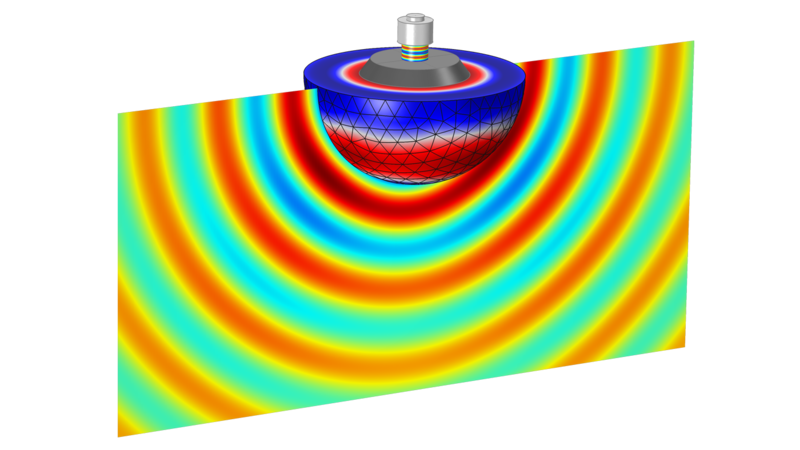 In the study of acoustics, it is common to simulate open problems where acoustic waves should be able to radiate without any reflections. This includes modeling the spatial sensitivity of transducers or scattering problems in sonar applications. Modeling nonreflecting boundaries is achieved using different techniques and features. Impedance conditions and radiation conditions exist for simple problems. For complex radiation patterns or advanced physics, it can be advantageous to use a so-called sponge layer. Using the multiphysics capabilities for modeling with the hybrid FEM-BEM approach, open problems are efficiently treated with BEM and the Pressure Acoustics, Boundary Element interface. For full control over simulations, you can use equation-based modeling to modify the governing equations and boundary conditions directly within the software, further customizing models for your own analyses. For example, you can model physics that are not predefined in the Acoustics Module or set up new multiphysics couplings. This includes modifying material models to model nonlinear effects by adding or modifying constitutive relations. Coupling physics in a nonstandard way is also possible. Examples of this include coupling acoustics and CFD to model acoustic streaming or the nonlinear effects of vortex shedding generated by acoustic waves. As an added benefit, by using an equation-based modeling approach and eliminating the need for fundamental coding, you can greatly increase the flexibility in what you can model and reduce the time it would take to set up simulations. Think of the time and energy you would be able to devote to new projects if you did not have to run repetitious simulation tests for other people on your team. With the Application Builder, built into COMSOL Multiphysics®, you can build simulation applications that further simplify the simulation workflow by enabling you to restrict the inputs and control the outputs of your model so that your colleagues can run their own analyses. With applications, you can easily change a design parameter, such as acoustic impedance, and test it as many times as you need without having to rerun the entire simulation. You can use applications to run your own tests more quickly or distribute applications to other members of your team to run their own tests, further freeing up your time and resources for other projects. 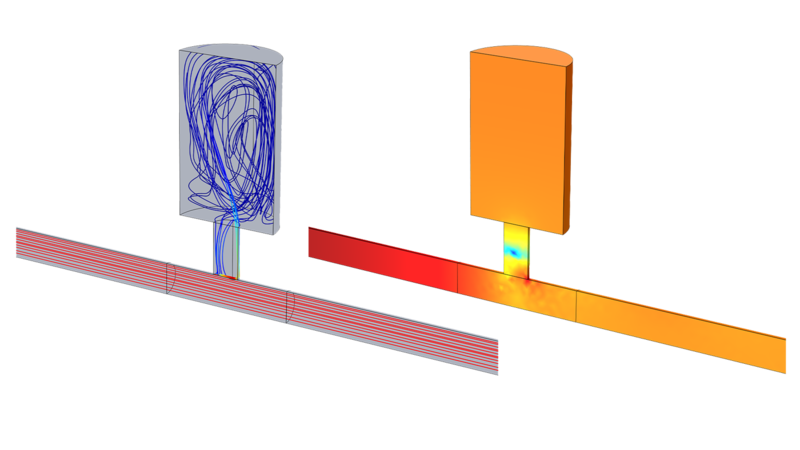 A simulation app for analyzing acoustic reflection, created with the Application Builder in COMSOL Multiphysics and the add-on Acoustics Module.